Best Amadeus quotes, ranked by fans. This list of great movie quotes from Amadeus collects all of the most famous lines from the film in one place, allowing you to pick the top quotes and move them up the list. Quotations from movies are repeated all the time in other movies, on television, in speeches and in day-to-day life, so having a good knowledge of good movie quotes (and having resources useful to search movie quotes) have become essential. Many of the most notable quotes come from sources you may not even know about, some could even be the most memorable Amadeus quotes or come from some of the other most quotable movies of all time. Consistently named one of the best movies of all time, Amadeus is told from the asylum room of rival composer, Antonio Salieri. The eccentric Mozart is shown to be a constant thorn in the side of the would-be great composer who instead lives in his shadow destined to be considered second to the lustful and flighty prodigy. 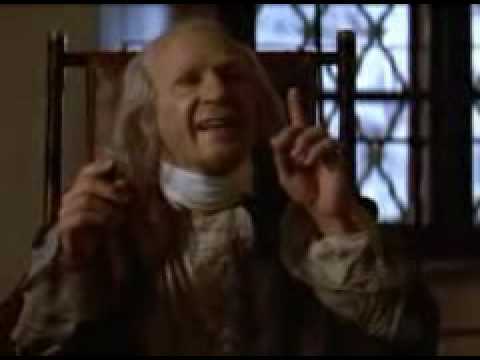 The film was a critical smash winning eight Academy Awards including Best Picture, Best Director, and fittingly, Best Actor for F. Murray Abraham (Salieri). This list includes all the best Amadeus lines and moments, just as they appeared in the actual movie script. Whether they are funny quotes, sad quotes, quotes about love or death, all the most famous Amadeus quotes are here. Salieri: All I wanted was to sing to God. He gave me that longing... and then made me mute. Why? Tell me that. If He didn't want me to praise him with music, why implant the desire? Like a lust in my body! And then deny me the talent? Salieri: But they showed no corrections of any kind. Not one. He had simply written down music already finished in his head. Page after page of it as if he were just taking dictation. And music, finished as no music is ever finished. Displace one note and there would be diminishment. Displace one phrase and the structure would fall. Father Vogler: It makes no difference. All men are equal in God's eyes.